I finally managed to get some holiday decorating done over the weekend. Yes, I realize it won't be long until it's time to take it all down again ... I've decided I'd rather be sorry to see it go than to say, "Thank goodness I don't have to look at that any longer!" Besides, I like to use cut evergreens throughout the house, and I didn't want to bother with wet floral foam and water pics to keep it looking fresh. I made the magnolia wreath the previous weekend. It still looks OK, but the magnolia cuttings over the fireplace were looking dry and rather sad. I'll show you what I replaced them with in a moment. To assemble the wreath, I took a basic old "evergreen" wreath and used craft glue to attach fresh magnolia leaves. The wreath was shedding and ready for the trash collector, so I figured I had nothing to lose. I already had the glue and the wired gold ribbon, so it cost nothing to make. With the red and green glass above the front door, the house seems to have a touch of the Christmas spirit all year 'round. The greenery remnants I used in the urns flanking the sidewalk were free at a nearby Lowe's store. It was in a bin near the entrance to the garden center. The workers were very nice, telling me to take all I wanted. I used inexpensive outdoor ribbon to make the red bows. I decided to leave the dried-up ferns in the urns to provide support for the greenery. I used artificial garland to decorate the staircase. As I'm sure everyone in Blogland knows, it's easy to create the illusion of real greenery by adding evergreen cuttings, strategically placed. The pinecones were already attached to the garland. I simply added clear lights and bows (I made them a few years ago to decorate the mailbox stand -- they just needed fluffing). It still seemed a bit plain, so I added thrifted drapery tiebacks and tassels. Shall we continue the "tour?" I added clear lights to the ficus tree in the dining room and garland to the sitting room mantel. I left the artificial garland in the center "un-fluffed" and used thin, vinyl garland down the sides. That allowed the real greenery I added to look lighter, more airy. I attached wired gold bows at the upper corners and used a mixture of red and clear lights. Somehow the bluish-green walls seemed to call for colored lights in this room. Vintage Cambridge candleholders and Fostoria Holly stems flank the mantel. I like the way the old mirror reflects the light and the sparkle of glass. Next we'll move to the den. Note the book on top of the stack on the coffee table. It's Komali Nunna's Entertaining From an Ethnic Indian Kitchen -- the cover's so beautiful! If you haven't seen the book yet, you should visit Komali HERE and place your order. It's would make a great last minute gift for someone you love (including yourself!). I attached glittery gold ornaments to this faux garland. Naturally, I added real evergreen cuttings. The ornaments were on clearance after Christmas last year (or year before) at K-Mart. They only look fragile -- they're made of styrofoam (which was nice since I dropped a couple of them as I quickly placed them!). I only wired the ones on that were near the edge or hanging over the sides). Would you like to see the tree? It's in the sunroom this year. I had a smaller one there two years ago. Viewing it from the den always made me think of being a child and seeing Christmas decorations in windows of shops. I used the biggest tree I have this year (don't ask how many are in the attic!). It's a 10 footer that came so close to the ceiling I decided to let a bow serve as the topper (a tall white angel in the attic was very disappointed!). Where are the gifts? The ones that are bought aren't wrapped yet! Obviously I like the excitement of last minute shopping (it seems so much easier to decide at the 11th hour!). Besides, we have to leave room for Santa to place the gifts he brings down the chimney! The "pearls" are strands of inexpensive beaded garland. I cut it into sections, looped it around my hand a few times, and used coated wire to attach it to the branches. The view from the deck. Baby, it's cold outside! I called last year's holiday table (below) "Fire and Ice." It was mostly silver and creamy white. I filled a compote with ornaments that looked like giant pearls and used lots of candles in vintage glass and silver holders. If you didn't see it, you can view the post HERE. 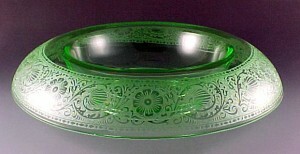 I think the vintage Heinrich and Company "Golden Harvest" dishes will be the ones I use this year. I spotted them at the local Goodwill store. Eight full place settings with lots of serving pieces. I'm probably tempting fate by telling you this, but there's not a chip or scratch on a single piece -- no sign of ever having been used at all. I suspect that they were someone's prized possession, displayed in a china cabinet since the 1940s or 50s. "Too nice to use" or "maybe someday ..."
I didn't have time to set a table for you with them yet, but I'll try to do that this weekend. See you next week? I have news to share from the nice folks at April Cornell. They're offering tablescape bloggers and readers an "Exclusive Tablescaper" promotional code to use online. To take advantage of their offer, please enter LINEN10OFF at Checkout. There's also a limited time promotion of 25% off current season product to which you can add your code for 10%. If you’d like to participate in their tablescapes contest, send pictures of table settings you’ve created with AC products. You could earn 100 April Cornell dollars! They've extended the deadline to January 3, 2011. Go HERE to read details and enter. 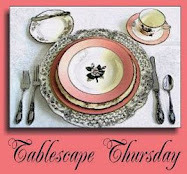 I'm linking to Susan's Tablescape Thursday at Between Naps on the Porch. I hope she won't mind since I only shared a picture from a previous tablescape (plus a "teaser" for next week). I hope you'll visit Susan and all her talented participants! I'm also linking to the Holiday House Tours Party, hosted by Julia of Hooked on Houses. Check it out HERE. Beautiful home and Christmas decoration dear Bill!!! Your home is beautiful Bill. I know it's a cliche, but it's true, the holiday decorations and tree are the icing on the cake. Oh, and how many trees do you have in the attic?*smile*. I love the fire and ice table and cannot wait to see next week's table setting. I hope you're enjoying the holiday season. Bill, you have such a beautiful home. Warm, cozy,elegant and inviting. I love what you did with the pearls..great idea. Your home is always beautiful Bill but never so more than all dressed up in its holiday decor.. Very beautiful and elegant, Bill. I love your tree! So Pretty!! Love your wreath. Great way to use the faux pearl garland. I did not decorate my stair banister this year - I have have really be slacking this year. Bill I always enjoy my visits to your lovely home. I think the front door wreath looks great. The tree through the windows does remind me of looking at a store display. Lovely and festive. Looking forward to your tablescape next week! I was wondering where you have been lately. I love your home all decorated for Christmas. It is stunning! I expected it to be beautiful but this is just gorgeous! True southern elegance! I love it! Your home is so brautiful and with the Christmas decoration just gorgeous. Nice wreath on the door, pretty garland and gorgeous tree. And the tablescape - great als always. It all looks fabulous, I wish I was there to visit you this Christmas. It looks so peaceful & serene. I have a few customers in the shop so I had better run. Magnificant. Every room. I especially love the way the lights on the tree reflect on and through the sunroom's indoor windows. Just wonderful. Bill, Your home looks stunning! I especially enjoyed seeing your tree looking from the living room into the sunroom. I wish you a Merry Christmas and a great New Year. Looking forward to seeing you again next week. Thanks for the tour of your beautiful home! The Christmas decorations are gorgeous! Love what you did to the staircase! Have missed you! Hope you are planning a wonderful Christmas celebration! Beautiful as always, and again I just love that brick entry. Stunning!! beautiful decorations...but what really caught my eye is the fabulous cornice in your den - is it fabric/wood? Love it! It is all just gorgeous Bill. I love seeing the tree through the window and how the windows reflect the lights. You have a beautiful home! What a blessing! Everything looks beautiful! That tree is so impressive, you decorated your home so wonderfully. I love the urns outside filled with the pine branches. Susan won't mind I am sure. I always love the flower picture when I see it in your photos. Well done to the artist... wink, wink. I left my decorating to last weekend and then I decided I would only put out a pared down version. I used a quarter of my 110+ Santas. First time ever I didn't put them all out. I like the draped pearls. A little something different. Bill, I love the rose picture.. no wait LOVE it. your tree is fabulous and your decorating tips are so appreciated. I loved your draped pearls.. very cool. I think my tree might get up tomorrow night, waiting on the snow to arrive. I'd love to just follow you around for one day... just to glean anything decorating related!! The entryway to your home is fabulous both inside and out! You did an amazing job with the wreath!!! The fireplaces look wonderful, too, and you did an outstanding job with all the classic decor on the table and around the house! Just incredible...as always!!! Everything is lovely, not that I'm surprised! I really like the red lights. I haven't used colored lights in so long that I almost forget how pretty they can be. The other non-Christmas thing that caught my eye was your entry/foyer? Is that a brick floor...very cool. I wish I lived somewhere that I could use magnolia leaves (or even get them). I've always loved that look for the holidays. It's always a treat to tour your lovely home, and see what new ideas you have shared this week. Your home looks stunning! I really enjoyed the tour! You really have captured the magic of Christmas and your tree is just glowing! How festive your front entrance looks, Bill...beautiful wreath & those red & green glass panels in the transom above the door are just PERFECT for the season! That chunky roping & tassels really make a bold statement down the staircase & your mantels looks positively AWESOME! The only word I have for your sunroom tree is WOW!!! I'm looking forward to seeing your Christmas table! Bill, so nice of you to open your home to us for the holidays - what a treat! It is so warm and welcoming. With these cold days upon us, it looks like the perfect place to snuggle into. I look forward to seeing the setting with the 'saved' china - Merry Christmas. Your house decorations look wonderful. I love the description of the "puddle" at the bottom of the stairs and also it is so true your tree does remind me of looking at the trees through the shop windows in London when I was little ( a long time ago). Love the red and green glass above the front door we had something similar in our house in London but not so grand! The vintage Heinrich and Company "Golden Harvest" dishes don't look very special piled on the table in the photograph, but I cannot wait to see how you use them in your tablescape with your cutlery / flatware and table decorations. I hope you find lots of lovely presents under that wonderful tree on Christmas Day from Father Christmas!! Happy Holiday, Jackie in Surrey, UK. Starting right at the front door - everything is lovely. Your tree is gorgeous and perfect in your sun room. Hope Santa is good to you! I'm hoping for some dishes! Can't wait to see your table using those lovely china. Your entire tabletop makes me feel very merry and bright! And that tree...sigh. Gorgeous decorations, Bill! I especially love the staircase garland -- so luxurious-looking! I'll look forward to your table set with the "new" china! Everything is just beautiful. I love the foyer! Your home is very warm and inviting. Thank you so much for sharing! I missed you!...I enjoyed every inch of your home decor..once again,Bill,you have out-done yourself, everything is so pretty. Oh Santa will be so charmed when he slides down your chimney -- he will want to linger over the milk and cookies at your home enjoying all your Christmas glow. Beautiful as always Bill. Awesome, spectacular, fantastic, elegant, gorgeous!!! No one can hold a candle to you dear Bill.....oh! Did I say that already?! Your house is beautiful and I'm loving getting to see so much of your rooms! Your tree is really pretty. Please show us more! Be still, my heart! I love your home and how you decorated it, starting with the beautiful front door. I enjoyed this tour so much--thanks for inviting us in! You've certainly been busy! Just beautiful... Can't wait to see how you "fancy up" the Golden Harvest! Your home is beautiful, Bill...the decorations are stunning. I love the red and green window above your front entry. All your decorations are fabulous but OH that tree. It is ginormous and wonderful!!!!! Bill, You have been a very busy guy!!! You really did a masterful job. But I have a real favorite among your festive decor... the magnolia wreath. I just swoon over magnolia leaves. I dream of having a large tree... but alas, they are hard to grow in my area, and especially because we live in a high place where we get hit with blustery and cold winter winds. So I will just enjoy your beautiful wreath. As usual everything you do is a true delight. Bill what a beautiful home! Love your red front door too. Here from the linky party. Beautiful! I love the green and red glass above your entrance...two of my favorite colors. Wow, Bill, your holiday decorating is enchanting, totally enchanting! Everything looks so magical. I think my favorite room is your den, because I still love the bar in there, that's my absolute favorite; and the fact that the den leads out onto the sunroom and you can see the tree out there from the den windows is just out of this world. Thanks for sharing your home with us. Have a wonderful Christmas and New Years, Bill. Bill, The tree in your sunroom is gorgeous!! I love the photo taken through the den window of your tree. 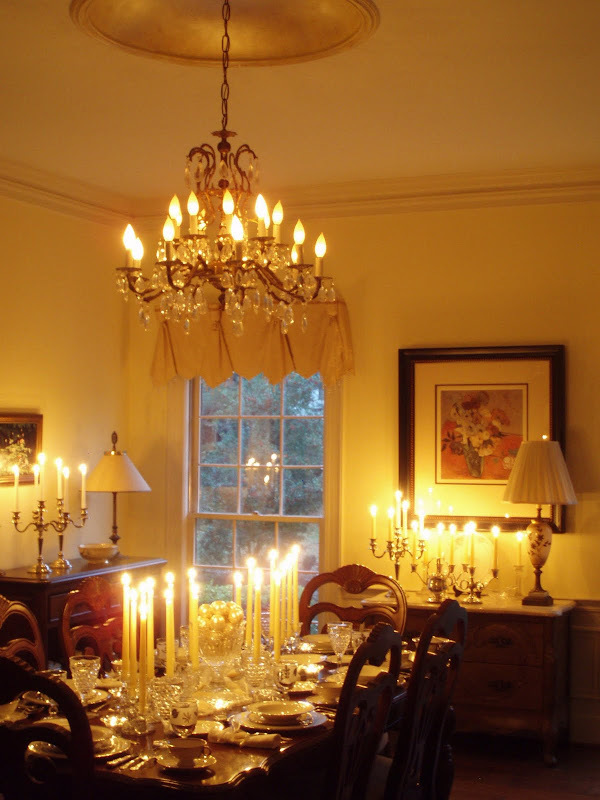 Your home is decorated for the holidays as beautiful as your table settings. Bill, I was checking and checking and then I missed your recent post! 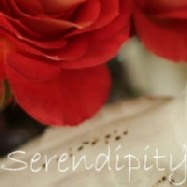 Finally added you to my blogroll. Your house is just stunning - I expected no less. I wish you lived closer and I would hire you to take my house to the next decor level! You have the eye of a stylist indeed. I love the pearls on the tree and the lovely garland everywhere. Your house is gorgeous anyway but you put the icing on the cake...! Everything looks so beautiful. The tablewear is beautiful. I know what you mean, busy busy busy. But you're right, better to be sad to put it all away. Your home is GORGEOUS!!! Absolutely to die for. Hope you don't mind, I decided to go through more of your posts! I loved seeing how you did your tree with the pearls..what a neat idea! You do have a lovely home and I enjoy seeing bits and pieces of it. That is one whopper of a tree! Your mix of natural greens with the artificial works really well!